Barley (Hordeum vulgare) is a common staple in human and animal diets. Part of the grass family, barley grows in over 100 countries and is one of the most popular cereal crops, surpassed only by wheat, corn and rice. Although barley is fairly adaptable and can be grown in many regions, it is a tender grain and care must be taken in all stages of its growth and harvest. In the United States, barley grows in nearly half the states, in both dry environments and those that need commercial irrigation. Barley is a short-season, early maturing crop. 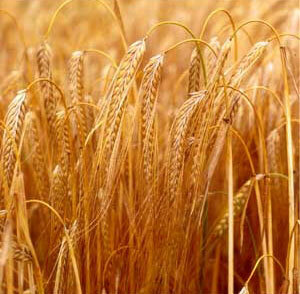 Barley's primary uses include animal feed, seed and malt production. In the U.S., a small amount of barley is used for food products, including bread and cookies as well as soups and pilafs. Malting barley is an ingredient for whiskey and beer. Because barley is a whole-grain food, consumption provides several health benefits. It is high is soluble fiber and can reduce blood cholesterol and blood glucose levels. Barley is also low in fat. Types of barley include hulled, hulless and pearled barley. When barley is hulled, the tough inedible outer layer is removed. Still considered minimally processed, the hulled barley is a whole grain. It comes in kernels, flakes, grits and flour. Hulless barley, also known as naked barley, still has the tough outer hull loosely attached. Pearled barley has the hull removed and is polished by a scouring process. Pearled barley can be purchased as regular, medium or fine, but is no longer considered whole grain. Pearled barley is available in the same forms as hulless and hulled barley, and additionally as quick cooking kernels or flakes. Pearled barley is widely available in supermarkets near the rice, dry beans and lentils. Barley flour is available in health food markets. It is used as a thickener for soups and stews, and also in baked goods. In recipes that need to rise, combine barley flour with wheat flour. Barley flakes are used like oatmeal or in baked goods. Find barley flakes in specialty stores with other cooked cereals or in bulk containers. Barley grits are also used like barley flakes, as well as in some commercial foods. To form barley malt, the barley kernels are soaked and dried. The kernels sprout in a controlled environment. Along with beer, uses for barley malt include extracts, syrups and flavorings. Cooked pearled barley added to a salad provides extra fiber. Main dishes, soups and stews, baked goods and breakfast foods also include barley as an ingredient. Breakfast recipes incorporating barley include frittatas, pancakes and hash. The total calories in barley (1 cup, cooked) is 193. In detail, the calories in barley are contributed by carbohydrates (175 calories), fats (5.8 calories) and protein (12.6 calories). Having 1 cup cooked barley is sufficient to meet 10 percent of the daily calories required by an adult. Similar to other cereal grains, barley is also rich in carbohydrates. The amount of carbohydrate present in 1 cup barley is 44.3 gram, which is equivalent to 15 percent the daily requirement for adults. Speaking about fats, the same amount of barley contains 1 gram fat. Barley is remarkable for its high dietary fiber content. Serving 1 cup cooked barley makes up to 24 percent of the daily needs, which accounts to about 6 gram. This high fiber content is the main reason why, barley is prescribed for individuals having bowel related medical conditions. One cup serving of cooked barley provides about 3.5 gram of proteins. This corresponds to 7 percent of the daily protein needed by an individual. However, this protein value may differ based on the type which you are using. Barley contains vitamin A, B1, B2, B6, B12, C, D, E and K in different amounts. Coming to mineral content in barley, it includes calcium, iron, magnesium, potassium, selenium and various other minerals that are required in trace amounts. Barley also contains copper mineral, which is rarely found in other food sources. In the body, copper is associated with several enzymatic actions, which strengthen blood vessels, bones and joints. Consuming 1 cup cooked barley provides approximately 32.0 percent of the daily copper requirement for a healthy adult. In addition, barley is a rich source of antioxidants and phytochemicals. When taken at a glance, barley nutrition is nearly the same as wheat. The main difference between these two staple foods is that barley is rich in both fibers (soluble and insoluble); whereas wheat contains high amounts of insoluble fiber. Another health benefit of barley is combating heart related problems, which is not so profound in case of wheat grains. For getting maximum nutrients, always opt for whole barley (or hulled barley). No doubt, it takes longer time for preparation. But, you can consider soaking whole barley grain overnight in order to minimize cooking time. The health benefits of barley are mainly attributed to presence of high percentage of fiber and negligible amount of saturated fat, including vitamins, minerals, antioxidants, etc. The high fiber content help maintain the intestinal health, thus minimizing risks of digestion problems, hemorrhoids and other intestine disorders. Being very low in sodium and cholesterol content, most physicians recommend barley for heart patients. It is claimed that consuming barley regularly is effective for lowering cholesterol and maintaining blood sugar levels. Barley is a rich source of insoluble dietary fiber. This increases the roughage content of your food, which in turn help in softening up the stool and also add bulk to it. For this reason, consumption of barley improves digestive health and reduces the chance of colon cancer and hemorrhoids. The insoluble fiber present in barley also prevents gallstones. The fiber content of barley facilitates production of propionic acid. This acidic component plays a major role in controlling the activity of enzyme HMG-CoA reductase which is responsible for production of cholesterol in the liver. This way it checks cholesterol level in the blood and protect you from some serious cardiovascular diseases. Barley cereal has an important phytonutrient component in it named lignans. Its antioxidant properties fight off the free radicals really well and provide protection to the cells from its harmful effects. This will give you a healthy heart. Moreover, it also lowers the chances of breast cancer and many other forms of cancer that are hormone related. Magnesium content of barley is quite high. This mineral substance reacts with the enzymes that control the blood sugar level in the body and thus helps to keep the glucose level in the body steady. This way it can control the chances of Type 2 diabetes to a great extent. Barley supplies a good amount of copper to your body which has the ability to reduce the intensity of the painful symptoms of inflammatory arthritis like rheumatoid arthritis. It also combines with some important enzymes of the body and increase the flexibility of stiff body joints, bones and even blood vessels. Another important mineral present in barley is phosphorus which is an essential component of a cells structure. It is also needed to form various compounds such as ATP, nucleic acids which has a major role in various metabolic processes. To yield maximum barley benefits, you have the option to use it in many different forms. Most importantly, each form of barley will not only supplement your body with barley nutrition mentioned above, but will also give you some extra health benefits. Like barley, grass contains the young leaves of its plants which has a large amount of chlorophyll present in it. So, one of the additional barley grass benefits is that it detoxifies your body and makes it free from toxins. Barley tea benefits include relieving symptoms of common cold and fighting off urinary tract infection. If you do not like the taste of barley, then you can try out barley water. It has a great taste and is often used as a soft drink. It contains distilled barley, fruit juices and sweeteners. Barley water benefits is no less than any of its other forms. The side effects of barley are yet unknown. However, those with gluten allergy should strictly avoid this cereal. Otherwise, it may lead to allergic reaction and upset stomach. The fiber in barley decreases your risk of developing hemorrhoids and diverticular disease, but it also aids in preventing constipation and diarrhea. But consuming too much barley before your body is prepared to process large quantities of fiber may produce the unpleasant side effect of abdominal bloating, gas and cramping.